My list, of course, is the running grocery list I have going at all times. It’s a square post-it note that sits on my desk and which everyone knows not to touch lest the provisions and dining schedule be thrown into chaos. My list will usually have several categories: “Japanese market,” “TJs” (Trader Joe’s), “Grocery” (general), “Sprouts,” and sometimes the odd addition such as “Persian market” or “99 Ranch”. Lacking specificity, I put my wife’s request under “TJs”. A few days later I was out shopping and picked up the wasabi peas at Trader Joe’s. At the next stop, the Japanese market, I also saw wasabi peas — and they were on sale! So I bought those, too. I would bring my wife a selection of wasabi peas, and surely she would love me more. I presented the peas to her the way a less creative man might bring roses, and she was pleased. She would be in peas for at least the next week. Then, she noticed something. “I think I have your next blog post,” she said, motioning me into the kitchen. There on the counter were two sets of peas. She pointed to them and nodded. Upon closer examination, I did notice that one pile of peas was a brilliant green, and the other was a kind of pale beige-ish yellow green. “Shows you what difference food coloring makes!” she said. “Maybe they blanched those ones first,” I offered optimistically. A quick scan of the labels gave the answer. The Trader Joe’s peas — the beige-ish ones — had exactly eight ingredients, the most foreign of which was rice flour. The Japanese Kasugai peas, despite the tagline, “A Happy Present from the Earth,” had a paragraph of 25 ingredients which included things like disodium 5 ribonucleotide, ammonium bicarbonate, glycerol esters of fatty acids, cyclodextrin and FDC blue no. 1 (brilliant blue FCF). And, of course, that old Japanese staple, monosodium glutamate (MSG). 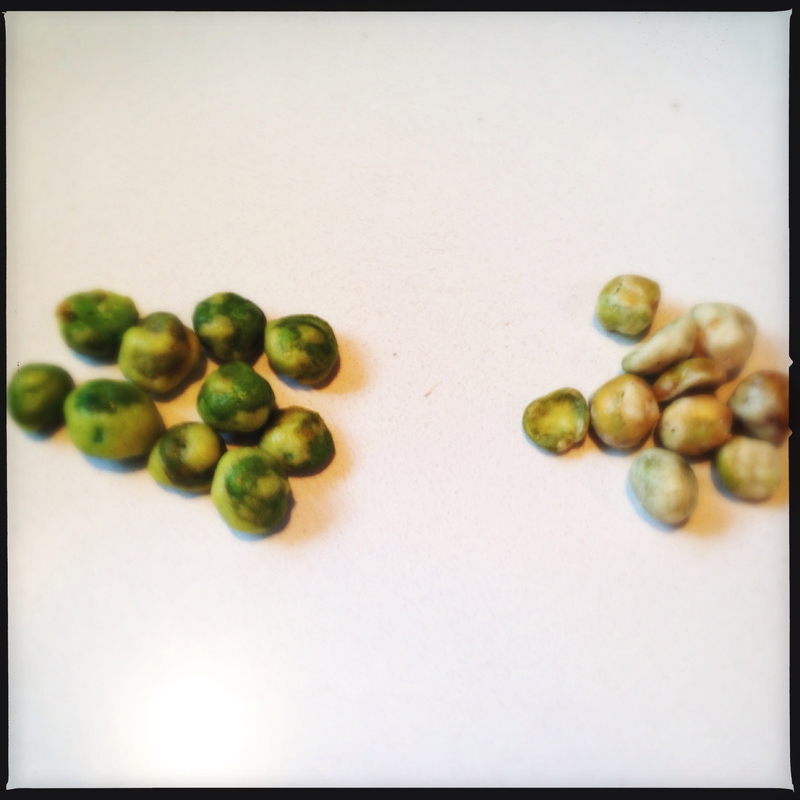 Which pea was better in our informal taste test? The beige-ish ones were hotter, while the bright green ones had a lightness and flakiness that I preferred — undoubtedly from the addition of the glycerol esters of fatty acids. They also benefitted from the addition of the MSG. And they were prettier. However, the difference was minimal and probably not worth the additional unpronounceable seventeen ingredients I was ingesting. All of which simply goes to show, some happy presents from the earth are happier and more from the earth than others. I love buying wasabi peas from different places and seeing which I like better. I often go to Fubon (the huge Asian market near my house) where there are bags upon bags of different brands of peas. Its always kind of a crap shoot since I never remember what I’ve bought before — every once in a while I get some that have no heat and other times they burn like hell. They burn so good! Love the burn. Catches you by the cajones, like the random hot shishito pepper. Definitely an eye-opener. I would go for the TJ peas every time!